Sally Rubin (AS/PC, ’20) volunteer as a camp counselor at the SU branch of Camp Kesem last summer. 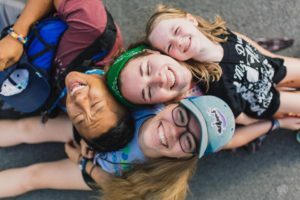 She and her classmates came to campus early then drove a few hours to a campsite to put on a free, week-long camp for children whose parents have cancer. S he was a counselor for the 6-9 year old girls as well as the Theatre/Drama program counselor. Sally plans to serve on the Executive Board for Camp Kesem this year and intends to do her best to return as a counselor every summer until I graduate.